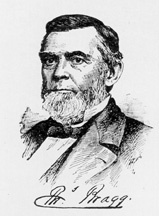 BRAGG, Thomas, a Senator from North Carolina; born in Warrenton, Warren County, N.C., November 9, 1810; attended the Warrenton Academy; graduated from Captain Partridges Military Academy, Middletown, Conn.; studied law; admitted to the bar in 1833 and commenced practice in Jackson, Northampton County, N.C.; member, State house of commons 1842-1843; prosecuting attorney for Northampton County; Governor of North Carolina 1855-1859; elected as a Democrat to the United States Senate and served from March 4, 1859, until March 8, 1861, when he withdrew; expelled from the Senate for support of the rebellion on July 11, 1861; chairman, Committee on Claims (Thirty-sixth Congress); appointed Attorney General of the Confederate States November 21, 1861, and served two years; resumed the practice of law; died in Raleigh, N.C., January 21, 1872; interment in Oakwood Cemetery. American National Biography; Dictionary of American Biography; Cowper, Pulaski. Thomas Bragg. In Lives of Distinguished North Carolinians. pp. 306-32. Edited by William Peele. Raleigh: North Carolina Publishing Society, 1898.